Lisa Lavie opened a YouTube account on March 6, 2007, and the following day she posted a video of her singing her original song "Falling for You." She later said she had not anticipated the effect YouTube would have on her career. Lisa's original song "Maple Leafs" was played on radio station 94.7 HITS FM in her native Montréal. On July 4, 2007 Lisa posted this video showing her reaction to the event, taped in a California recording studio. Lisa vowed to respond to each viewer comment, which soon numbered in the thousands. The strategy backfired: on September 11, 2007, YouTube software interpreted Lisa's many replies to be computer bot-generated spam, and automatically suspended her account. Two agonizing days after suspension, her account was reinstated. Lisa memorialized her ordeal in this comic video, posted September 19, 2007. The video shows her wearing the wrist brace needed to treat the carpal tunnel syndrome that she had acquired during her many hours at the computer. Lisa first posted her original song "Angel" in two parts (June 21 and July 10, 2007), each sung inside a car. On September 6, 2007, she posted this high-energy studio version of the entire song. On about September 28, 2007, YouTube began a one-week feature of the video on its front page. By the fifth day, October 3, 2007, "Angel" had already registered its 1,000,000th view. For days surrounding this event, Lisa led marathon commenting/reply sessions with her online fans. Many came to know not only Lisa, but each other. Team Lavie was born. The following spring, "Angel" was to become the best-selling track on her debut album on iTunes. The success of the "Angel" video attracted media attention within weeks. The national television program Entertainment Tonight Canada interviewed Lisa in Los Angeles, and broadcast this feature on October 24, 2007. She was dubbed "The Next Mariah Carey," owing to her discovery by the co-producer of the first album of her childhood idol, Mariah Carey. Lisa's vocal style and range, and favored music genre have also invited comparisons to Carey. On November 22, 2007, a month after the Entertainment Tonight Canada feature, ETalk featured how "music stars" like Lisa would "get to the top on their own terms," referring to her success without the support of a major music label. Lisa explained how in today's music business, to earn the confidence of skittish record labels, artists have to create their own buzz. Using YouTube and other social networking websites, Lisa had done just that. 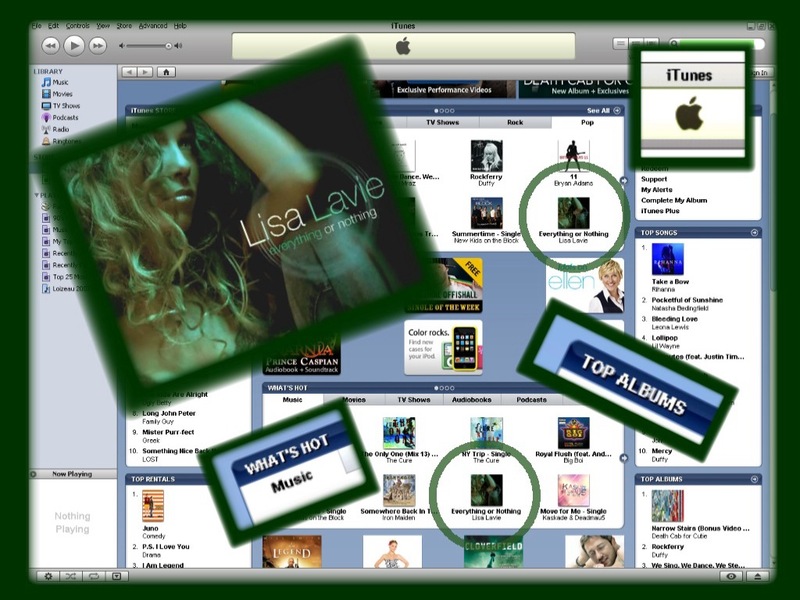 On May 13, 2008, Lisa's independently produced debut album Everything or Nothing appeared on iTunes. Everything or Nothing was featured in the "What's Hot" section of the iTunes front page, and reached as high as #20 on the iTunes pop chart. This performance was achieved without the backing or support of a major music label. Meanwhile, on YouTube, a video of Lisa singing the title track of her album was featured on the website's front page. The video achieved its 1,000,000th view about three months after being posted (YouTube had shortened its feature durations to one-half week after "Angel" was featured the previous October). On July 4, 2008, Lisa headlined her first major concert. At the "Sparkle Event" in Santa Barbara, California, Lisa sang original songs from her album Everything or Nothing. As Lisa's subscribership and video views grew, she branched out into new creative endeavors. In this video posted March 26, 2009, her vocals accompany actor and impressionist Iman Crosson (YouTube channel "Alphacat") in a collaborative musical spoof of T.I. 's "Dead and Gone." On October 3, 2009, Lisa headlined the concert after the "Women Taking Care of the World" conference at the Mahaffey Theater on the waterfront of St. Petersburg, Florida. Poetically, that very day marked the second anniversary of the day her "Angel" video had reached its 1,000,000th view. By the day of the concert, her YouTube videos had accumulated a total of over 26,000,000 views, and three days after the concert her subscribership crossed the 90,000 threshold. After the January 2010 earthquake in Haiti, Lisa conceived an idea to benefit earthquake victims. She organized unsigned or independent YouTube musicians to form a collaborative video, "We Are the World 25 for Haiti (YouTube Edition)," as a video response to the celebrity single "We Are The World 25 For Haiti." As video files arrived electronically from 57 musicians from around the world, Lisa and Iman Crosson endured a three-day editing marathon to create a masterpiece 7.5 minute video that was posted on February 20, 2010, only eight days after the celebrity version was released. Lisa's video was "Spotlighted" on YouTube's main music page, received its first million views in less than seven and a half days, and at times received more than eighty YouTube "Honors." Almost immediately, the video's success drew media coverage around the world, including CNN, USA Today, Radio Canada, Straits Times (Singapore), Detroit Free Press, St. Petersburg Times (tampabay.com), EditieNL (Netherlands). was posted, Lisa was interviewed on CNN via Skype. Distinct versions of the interview were aired, the first two on March 6, 2010 and the third the following morning. The video shown here is the second of the three versions. Even before the CNN interview, Lisa's video had attracted worldwide media attention. During the afternoon of Friday March 19, 2010, ABC World News online posted a Skype interview in which Diane Sawyer interviewed Lisa and other singers from "We Are the World 25 for Haiti (YouTube Edition)." By the evening, Diane Sawyer had decided that Lisa, co-editor Iman Crosson, and the other participants in the video would be named "ABC News Persons of the Week." This segment was broadcast nationally on ABC World News that evening. On July 13, 2010, Lisa performed her hit song "Angel"
on CTV's "Canada AM" which was broadcast throughout Canada. "We Are the World 25 for Haiti (YouTube Edition)." The announcer saluted Lisa's then 40 million+ YouTube views. In September 2010, Lisa was chosen to be one of two vocalists to perform in Yanni's international tours. In the ensuing years, Lisa performed with Yanni's renowned international orchestra before hundreds of thousands of people in over thirty countries on five continents. throughout the Eastern U.S. and Canada.